Monu is an open source process monitoring menu bar application for Mac OS. You can configure Monu to launch programs, and when Monu starts up it will start them. Additionally, it will monitor the processes and restart them if they crash. Monu is a portmanteau of 'monitor' and 'menu'. It has two C/C++ dependencies, Electron (which includes iojs) and the mon process monitor. Monu is currently ALPHA STATUS and is intended for developers/early adopters. 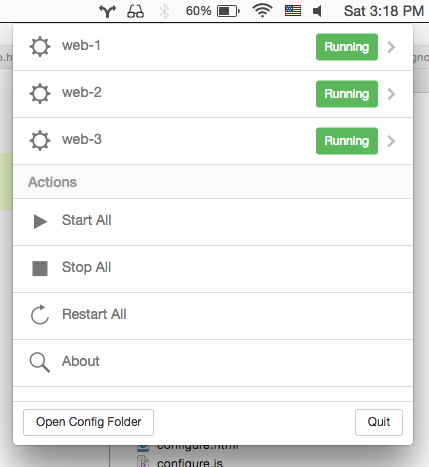 To configure Monu, click 'Open Config Folder' and open 'config.json' in a text editor. When you save and return to Monu your new configuration will be automatically loaded. "web-3": "http-server . -p 8083"
When you open Monu.app, it will start all configured processes. 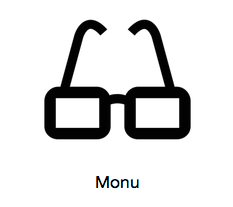 If you would like Monu.app to start when your Mac starts up, got to System Preferences > Users and Groups and add Monu.app to Login Items for your User. Before publishing, make sure that your repo is clean, and that you've created a tag for the latest commit. npm version [major|minor|patch] will do this for you, increasing the package.json version, creating a commit and adding a tag.